It might even strike some as morose at first blush: asking friends to build your casket. But this poignant experience provided a tangible way for a group of church members to express a deep level of caring for the Wayne and Shannon Sneary family of Harrisonburg. Wayne Sneary, 41, who was receiving Hospice care, died peacefully at home the afternoon of June 2 after almost 10 years of living with an oligoastrocytoma, a grade 2-3 brain tumor. Besides wife Shannon, he left three children – Justus, 11; Jalyn, 7; and Jedrek, 3; and extended family members. Although the tumor’s location affected his senses, with high potential for seizures, and despite a grueling regimen of radiation and chemotherapy treatments and medications, Wayne was able to work – not always full time – as a builder with Community Construction Company of Harrisonburg for many years. For a long time, tests indicated no new fast-growing cells, indicating that the tumor had drawn back, although a malignant growth remained. While he struggled with short-term memory loss and the family experienced other difficult health issues, Wayne sought to live with his debilitating illness and make the most of each day, receiving much support from extended family and fellow members of Community Mennonite Church in Harrisonburg. Wayne found substantial encouragement along the way from fellow members of the Dunkin’ Donut Sunday school class, a men’s discussion group at Community Mennonite that met every Sunday at the Exxon/Dunkin’ location at the corner of W. Market and Cantrell Ave. It didn’t hurt that Wayne seemed to thrive on a regimen of donuts and Diet Coke. Members of the Dunkin’ Donut group reached out to Wayne at a critical time when seizures prevented him from driving. “This group became extremely important to Wayne in helping him find meaning in his illness through this bonding process,” said Terry Burkhalter, a class member who took Wayne on a number of day trips to scenic and historic places in Virginia, West Virginia and Maryland. “We went out of our way many times to find donuts” on these outings, Terry noted. “With Wayne’s lengthy illness, the Donut class came together in a meaningful way to care deeply,” Terry said. “Wayne’s openness to talk about what was happening to him allowed all of us to reflect seriously on our own lives and mortality.” That support quickly took on practical applications as Community persons transported Wayne to Charlottesville for radiation treatments several days a week for months. Shannon and Wayne had discussed the homemade casket idea several times in the past. Then, in a recent conversation, when it was plain that Wayne’s days were numbered, pastor Jennifer Davis Sensenig contacted the Donut class. Within two-and-a-half hours after pastor Sensenig’s phone call to Terry Burkhalter, he had a design for the casket and commitments from the Donut group to build it. Terry met with the McMullen Funeral Home director to get specifications and found the director “very supportive and affirming” of what they wanted to do. The project was done in Community member Jay Hartzler’s shop in Park View. Twenty persons – 18 men from the class along with Terri Roth and Betty Simensen who did the casket lining – were involved; it began the evening of May 27 and by Memorial Day evening was completed, ready for delivery to the funeral home. “The decision to use pieces of wood donated by group members was a risk at first, but it all fell into place,” Terry noted. The main body of the casket was veneer oak plywood. 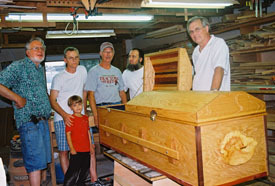 The inside of the top cover of the casket is lined with strips of pine, ebony, black walnut, white oak, red oak, maple, cherry, cedar, Manitoba maple and tulip popular. Even though Wayne wasn’t able to speak in his final days, he was aware that this group of close supporters was making the casket. Many people will, Shannon, especially those members of the Donut class at Community Mennonite Church who stepped forward to fashion a beautiful sanctuary that became Wayne’s final resting place.